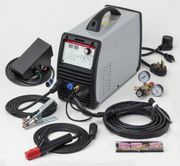 This compact AC/DC Inverter TIG welder with FREE shipping produces 200 Amps of output power and is perfect for welding aluminum and steel alloys from #24 Ga. to 1/4" found in automotive and light-industrial applications. Inverter design provides for portability (weighs 27 Lbs.) and infinitely adjustable smooth power operation. Connects to 115 or 230VAC input with jumper plug. Attach the electrode holder and weld thicker metals using 3/32" & 1/8" electrodes. lift-arc or high-frequency start, power slope up & down, output frequncy & power, pre & post gas time are all independantly adjustable by the operator. Unit is furnished with preloaded programs for most standard steel & aluminum alloys and can store customer specific programs as well. Package includes: inverter power source, SR17 Tig torch with 12' cable assembly, foot pedal control, work clamp & cable, stick electrode holder & cable, gas regulator, AK-2 accessory kit and complete Operator instruction manual. * Free shipping of TG2010 package.